On July 31st, Bellator MMA will return to the Santa Ana Star Center in Rio Rancho, New Mexico, where they will bring their successful promotion to our area for the second time. The Bellator 97 event as scheduled is set to be on paper one of the most stacked card in New Mexico MMA history as it boasts two world title fights that will be featuring two of the highest ranked fighters in the world in their respective divisions. Scheduled for the two main fights, the promotions brings in top ranked Ben Askren and Michael Chandler to defend their welterweight and lightweight titles as well as promoting the conclusion to the light-heavyweight tournament featuring “King Mo” Lawal. Before those main card fights, there will be a main event for regional New Mexico fight fans between Judgement MMA’s Adrian Cruz (4-0) and Mean 1 MMA’s Felipe Chavez (6-3) who are penciled in for a bantamweight bout. Cruz very well may be one of the states top prospects within our regional scene and Chavez is making his career resurgence after more then three years of inactivity. There is one word to best describe this match up –“intrigue”. The word in its technical definition implies fascination, screams the arousal of curiosity and really pushes the idea of being of interest. It couldn’t be more fitting tied to the Bellator 97 match up between Cruz and Chavez. The intrigue stems from several different facets of the match up including how their styles are similar and opposite simultaneously and that they come from gyms that carry some history between them. Felipe “Flip” Chavez is notably the cousin of UFC star Diego Sanchez and just ended more then three years of inactivity at the inaugural Triple-A-MMA event labeled “Win To Get In”. 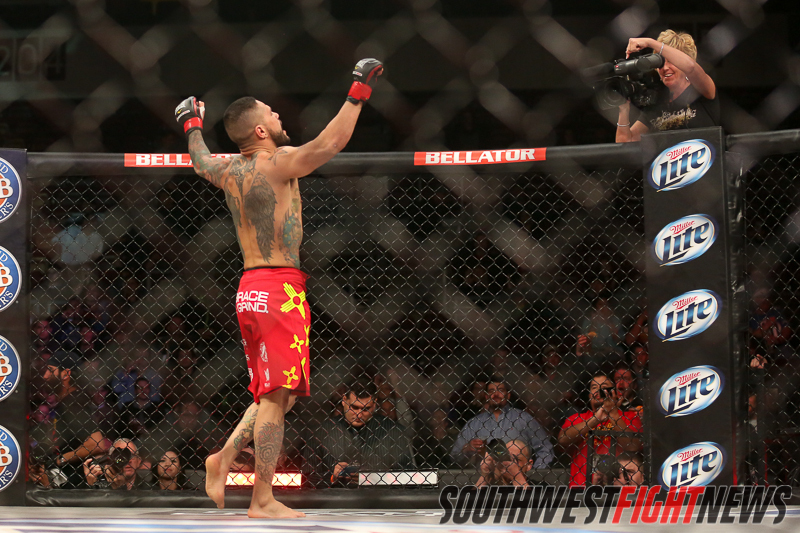 The event was billed as an opportunity to get a fight on the bigger stage of Bellator MMA and with the win Chavez drew Cruz in his debut fight for the promotion. Training out of Mean 1 MMA in Rio Rancho, Chavez is equipped with very strong punches that when landed clean they make an impact and kicks that land with a thud, making his striking arsenal very dangerous. Putting the dangerous stand-up game aside, “Flip” has proven to be a terror to his opponents once the fight hits the mat as Flip has five career submission victories all of which he executed in the first round. Most recently, Chavez went back to his submission roots at the Triple-A-MMA event submitting Lovato Total Fitness fighter Ronnie White in the promotions inaugural event titled “Win To Get In”. In that fight, Chavez would work off his back actively to secure a fight ending triangle choke. With the win, the shows premise was based around the idea that a win would secure the fighters entrance to a Bellator show. Chavez was awarded that shot against Adrian “Killa” Cruz who made his Bellator debut in February in the shows inaugural event in Rio Rancho. 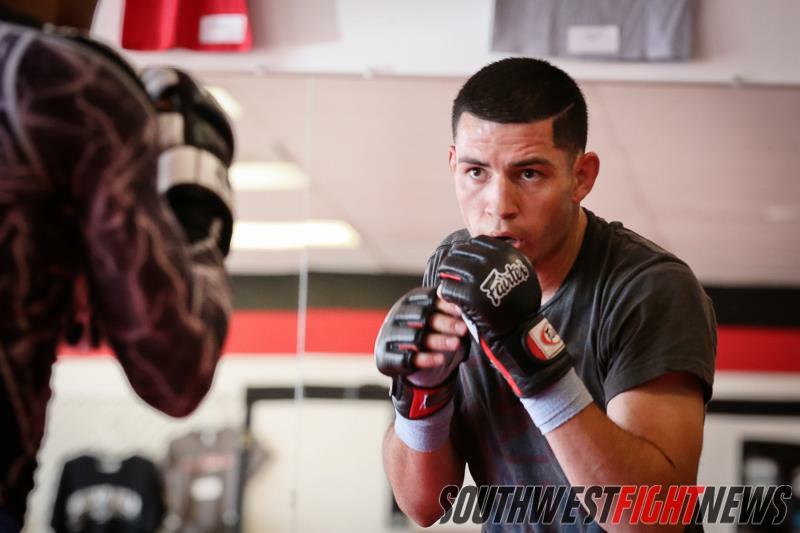 Cruz would face off with Jackson-Winklejohn fighter Nick Gonzales at Bellator 91 and the fight would end up as one of the most talked about bouts on the undercard. After winning the first round with effective striking and grappling, utilizing his strength advantage especially visible in the clinch, Cruz would land a nice trip takedown off of the fence and land into side control. From there, Cruz would submit Gonzales quickly with a arm-lock from the scarf hold position, a move that is traditionally only seen in Gi Jiu Jitsu. In simple terms, Cruz trapped an arm with his legs and used the angle he was sitting in to crank on it much like a kimura. The rare and impressive submission would add fuel to the already blazing fire behind the hype and prospect status of the undefeated Cruz. The skill set of “Killa” Cruz both mirrors and opposes the style of Chavez as Cruz also brings very strong punches and kicks in his striking tool bag. He has very heavy hands that visibly stun opponents when they land clean. Aggressive in his attack, Cruz smothers and overwhelms with pressure and pushes a fast paced, frenetic pace. His style opposes Chavez in the ground game as Cruz dominates and attacks from top control. Looking to impose his will, Cruz is a powerful top wrestler with solid takedowns and ground and pound work. Their pace is also complicatedly similar and opposing, Cruz and Chavez both are fast paced in their onslaught but Cruz traditionally will start the fight slower paced while Chavez has shown his desire to push the action right from the opening bell. Cruz has an offensive onslaught that truly swarms opponents, either you find your back on the fence or flat on your back if you aren’t keen on countering Cruz’s attack. The skill sets of the two bantamweights can make for pure excitement for fight fans regardless of what their favored style of fighting. If the fight stays standing both fighters will bring crisp technical striking skills and can really alter the fight with their powerful, knockout inducing strikes. Both fighters like to push the pace, which would indicate that both fighters will not spend much time hesitating or waiting for opportunities as both seek to create their own openings. On the ground, Cruz pushes wrestling and looks for powerful takedowns and slams; Chavez is a tactical ground grappler who has an active guard hunting constantly for submissions. If the fight does go to the ground it should be expected that Cruz ends up on top with Chavez working from beneath him and the chess match of grappling will favor whoever implements their strategy more effectively. Will Cruz be superior in positional grappling and ground strikes or can Chavez sweep or submit Cruz from his back? Behind the scenes, the story line between Chavez and Cruz continue as there is a history between the pair and their respective gyms. 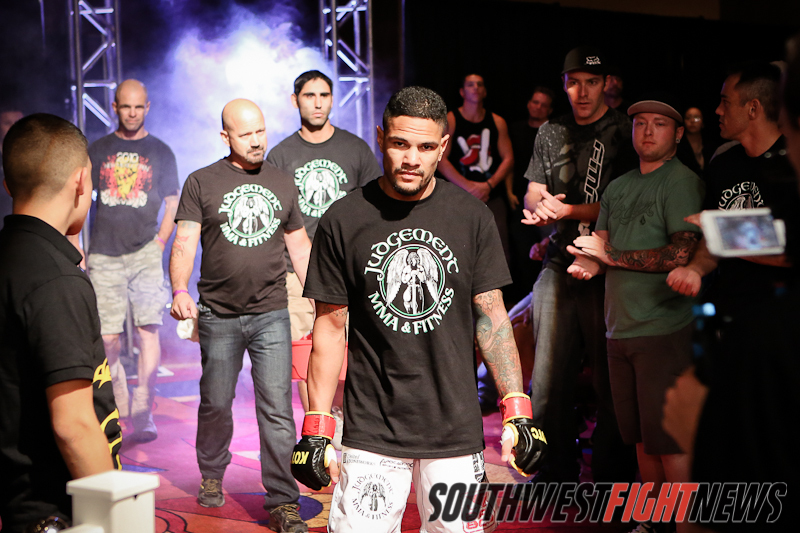 Judgement MMA Head Coach Scott Marlowe is the formerly coach of Mean 1 MMA in Rio Rancho where Chavez now trains. The gym is now lead by Head Coach Chris Luttrell. The story however doesn’t stop there as it continues with Chavez making the move to Mean 1 MMA this past year around the time he was expected to be on the Bellator 91 card in Rio Rancho before an injury prevented that from happening. Prior to the fight, Chavez made the move to his new gym from Judgement MMA where he trained under Marlowe and alongside Cruz. Will Cruz impose his will and take over the standup or will Chavez be able to match intensity and force the aggressive Cruz to respect his own power? Will Chavez be able to work offensively with Cruz’s smothering ground game or will Cruz show more of his progressively improving submission game? Once teammates, will the camaraderie have an effect on either fighter and possibly cause some hesitation which is extremely uncommon for both fighters? Both fighters have already battled one another in practice which if history is an indicator, the fighter who triumphs may be the one who has made most strides in progressively bettering their MMA game. Earlier in the year, Bellator MMA featured a Bantamweight title fight between two teammates and many believe the fight was decided when it was evident which fighter had improved the most. With all of storylines in place, this fight screams “Fight of the Night”. With so much intrigue surrounding this bout, look for it to be the highlighted “Main Event” of the undercard. Both fighters have large followings of fans and should really get the crowd roaring inside the Santa Ana Star Center. Stay tuned to SWFight.com for more Bellator coverage, fight breakdowns and updates.